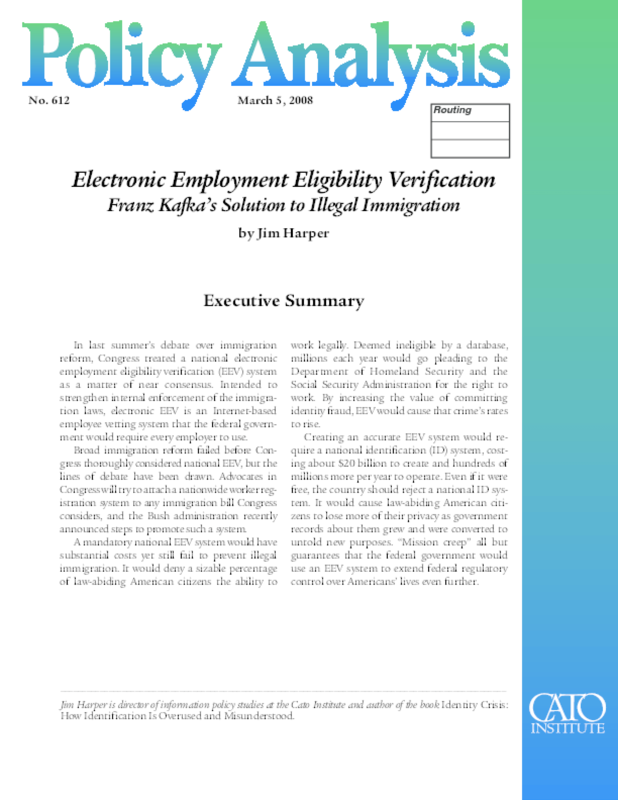 In last summer's debate over immigration reform, Congress treated a national electronic employment eligibility verification (EEV) system as a matter of near consensus. Intended to strengthen internal enforcement of the immigration laws, electronic EEV is an Internet-based employee vetting system that the federal government would require every employer to use. Broad immigration reform failed before Congress thoroughly considered national EEV, but the lines of debate have been drawn. Advocates in Congress will try to attach a nationwide worker registration system to any immigration bill Congress considers, and the Bush administration recently announced steps to promote such a system. A mandatory national EEV system would have substantial costs yet still fail to prevent illegal immigration. It would deny a sizable percentage of law-abiding American citizens the ability to work legally. Deemed ineligible by a database, millions each year would go pleading to the Department of Homeland Security and the Social Security Administration for the right to work. By increasing the value of committing identity fraud, EEV would cause that crime's rates to rise. Creating an accurate EEV system would require a national identification (ID) system, costing about $20 billion to create and hundreds of millions more per year to operate. Even if it were free, the country should reject a national ID system. It would cause law-abiding American citizens to lose more of their privacy as government records about them grew and were converted to untold new purposes. "Mission creep" all but guarantees that the federal government would use an EEV system to extend federal regulatory control over Americans' lives even further.